Robert Guerrero (33-3-1, 18 KO) is not a welterweight. Even Floyd Mayweather, who is considered by his peers to be a small welterweight, began his professional career as a super-featherweight. Guerrero started even lighter as a featherweight. Guerrero chased Mayweather into the welterweight division thinking that Mayweather was not the type of boxer to overpower him. Even though Guerrero was able to impose himself on former welterweight champion, Andre Berto (30-4, 23 KO), Berto's very muscle-bound physique reveals something about him: like current welterweight champion, Tim Bradley (33-1-1. 13 KO), his small frame allows him to make weight while carrying so much muscle. But the skeleton is more dense than muscle and is what transmits punching power. That is to say, Guerrero fought, in Berto, a muscle-bound small welterweight at best. Keith Thurman (26-0, 22 KO), a natural welterweight, was able have his way with a slower and smaller Guerrero. Whereas Guerrero should be working himself down to the light welterweight division, where his punch resistance and durability will serve him better against fighters nearer his size, Danny Garcia's (31-0, 18 KO) growing bone structure forced him up to the welterweight division. That is, I expect Danny Garcia to have a size and strength advantage over Guerrero. Shop-worn from slugfests in the past several years, Guerrero still has a chance to defeat Garcia. Very recently against Lamont Peterson (34-3, 17 KO), it was shown that Garcia has slow feet, fatigues, and can be outworked on the inside. So Guerrero will do well with a high work rate that includes a combination of jabbing and mauling. 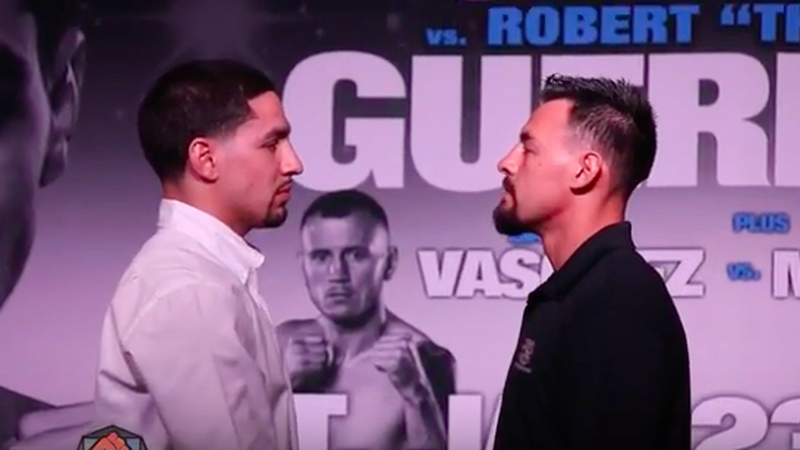 However, that Guerrero was dropped and hurt by light-punching Aaron Martinez (20-4-1, 4 KO), in what was supposed to be a tune-up in his hometown after his loss to Thurman, indicates that giving-and-taking will not serve Guerrero as well against Garcia as it did with Berto. For Guerrero was still fresh when he fought Berto, and the wear and tear on Guerrero is such that it can be seen in his face during interviews. Robert Guerrero (33-3-1, 18 KO) is not a welterweight. Even Floyd Mayweather, who is considered by his peers to be a small welterweight, began his professional career as a super-featherweight. Guerrero started even lighter as a featherweight. Guerrero chased Mayweather into the welterweight division thinking that Mayweather was not the type of boxer to overpower him. Even though Guerrero was able to impose himself on former welterweight champion, Andre Berto (30-4, 23 KO), Berto's very muscle-bound physique reveals something about him: like current welterweight champion, Tim Bradley (33-1-1. 13 KO), his small frame allows him to make weight while carrying so much muscle. But the skeleton is more dense than muscle and is what transmits punching power. That is to say, Guerrero fought, in Berto, a muscle-bound small welterweight at best. Keith Thurman (26-0, 22 KO), a natural welterweight, was able have his way with a slower and smaller Guerrero. Whereas Guerrero should be working himself down to the light welterweight division, where his punch resistance and durability will serve him better against fighters nearer his size, Danny Garcia's (31-0, 18 KO) growing bone structure forced him up to the welterweight division. That is, I expect Danny Garcia to have a size and strength advantage over Guerrero. Shopworn from slugfests in the past several years, Guerrero still has a chance to defeat Garcia. Very recently against Lamont Peterson (34-3, 17 KO), it was shown that Garcia has slow feet, fatigues, and can be outworked on the inside. So Guerrero will do well with a high work rate that includes a combination of jabbing and mauling. However, that Guerrero was dropped and hurt by light-punching Aaron Martinez (20-4-1, 4 KO), in what was supposed to be a tune-up in his hometown after his loss to Thurman, indicates that giving-and-taking will not serve Guerrero as well against Garcia as it did with Berto. For Guerrero was still fresh when he fought Berto, and the wear and tear on Guerrero is such that it can be seen in his face during interviews. Garcia by decision.